Today in the 21st Century, it’s not uncommon for people to ride bicycles to work. Even on these cold winter days, there seems to be at least a few people out on their bikes. But let’s take a look back to see what your bicycle might have looked like in the late 19th Century. There are many bicycle-related catalogs in the Trade Literature Collection at the National Museum of American History Library. Here is just one example. The catalog is from 1895, by Crawford Mfg. Co. of Hagerstown, Maryland, and titled High Grade and Juvenile Bicycles. Crawford Mfg. Co., Hagerstown, MD. High Grade and Juvenile Bicycles, 1895, front cover of catalog showing illustration of two unicorns. 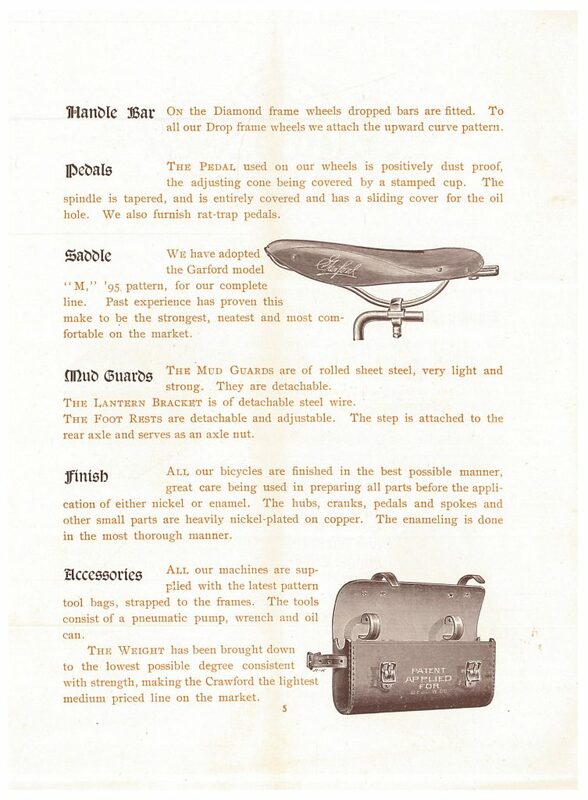 The first few pages provide a general description of the company’s line of bicycles. Different parts are described, such as the handle bars, pedals, mud guards, and chain adjustments. The frame is described as “symmetrical and correct mechanically” and the wheels as “rigid, light and strong.” The saddle used on the Crawford bicycles was the Garford model “M,” ’95 pattern, which is illustrated below. Crawford Mfg. Co., Hagerstown, MD. High Grade and Juvenile Bicycles, 1895, page 5, Garford model “M,” ’95 pattern saddle for bicycles and information about the bicycle’s handle bars, pedals, saddle, mud guards, finish, and accessories. 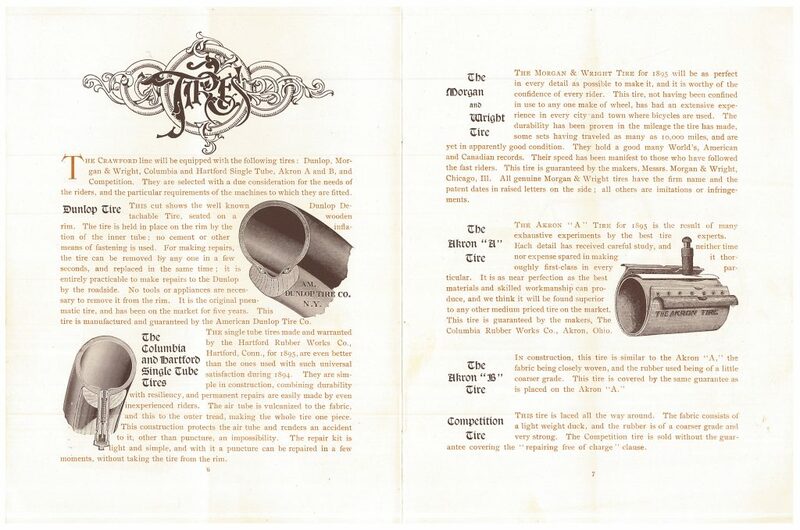 There are also two pages describing the tires for the Crawford line of bicycles. These were the Dunlop Tire, Columbia and Hartford Single Tube Tire, Morgan and Wright Tire, Akron “A” Tire, Akron “B” Tire, and Competition Tire. The choice of which tire was fitted onto which bicycle depended on the need of the rider as well as the requirements of the particular bicycle. Crawford Mfg. Co., Hagerstown, MD. 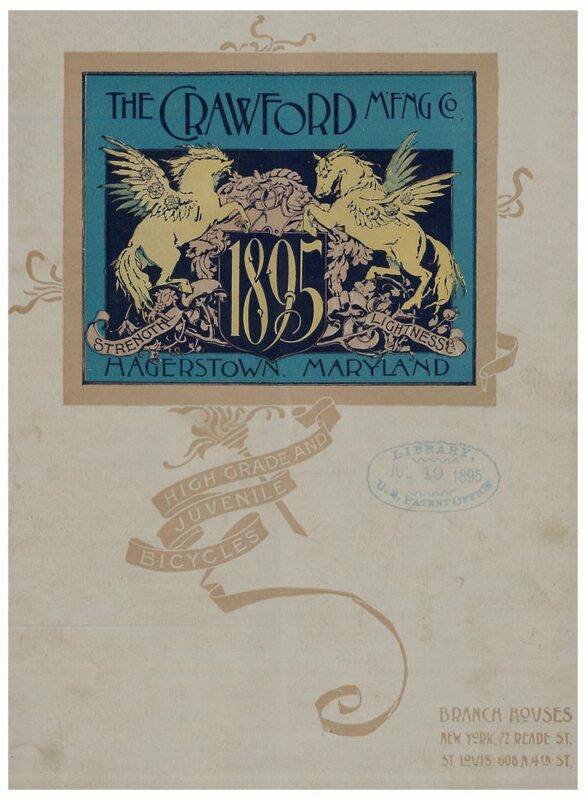 High Grade and Juvenile Bicycles, 1895, pages 6-7, tires used on the Crawford bicycles. Eight bicycles are pictured in the catalog along with an accompanying page of information. One of these bicycles is the Crawford No. 19 Bicycle. It could be fitted with Columbia single tube tires, Akron “A” tires, or Dunlop tires. If it was fitted with wood rims, it weighed 24 pounds, but when fitted with steel rims, it weighed 26 pounds. Crawford Mfg. Co., Hagerstown, MD. High Grade and Juvenile Bicycles, 1895, pages 8-9, Crawford No. 19 Bicycle. 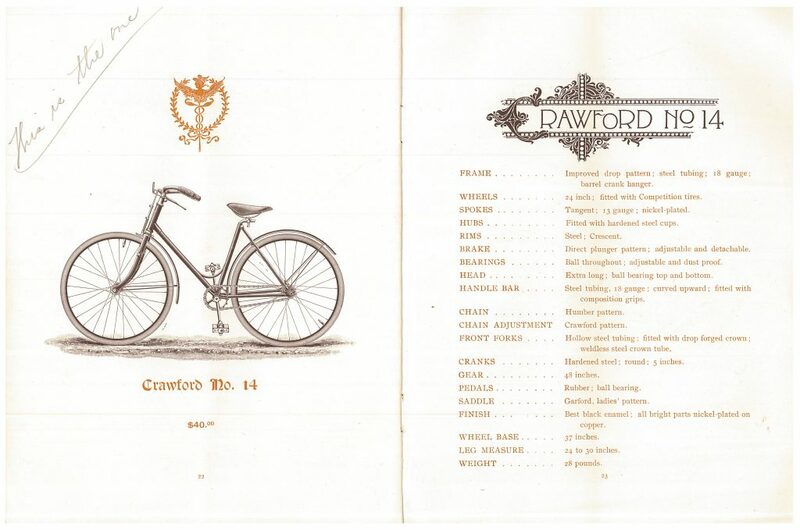 Illustrated below is another bicycle from the catalog called the Crawford No. 14. This bicycle was fitted with Competition Tires and a Garford, ladies’ pattern, saddle. It was finished in black enamel and weighed 28 pounds. Crawford Mfg. Co., Hagerstown, MD. 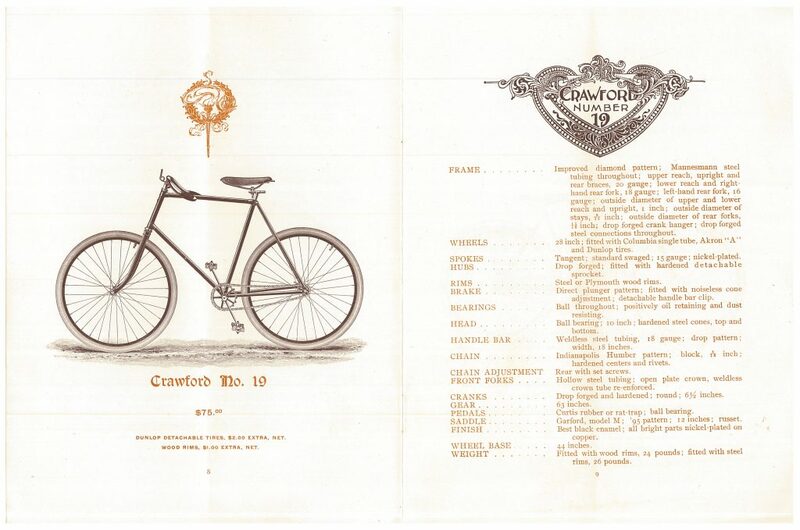 High Grade and Juvenile Bicycles, 1895, pages 22-23, Crawford No. 14 Bicycle. High Grade and Juvenile Bicycles by Crawford Mfg. Co. is located in the Trade Literature Collection at the National Museum of American History Library. Interested in more bicycle catalogs or other resources? There are many posts on the Libraries’ Blog about bicycles, including a post about a 19th Century European Tour on bicycles and a post about bicycle related resources available at Smithsonian Libraries.